What does it mean to practice therapy in an existential way? What are the different existential approaches? What are their strengths and limitations? Focusing on practical, face-to-face work with clients, the book introduces students to six existential therapies, highlighting areas of commonality and difference, and discusses key figures and their contributions, including Yalom, van Deurzen, Spinelli, Frankl and Laing. It outlines the critical perspectives and key debates, and presents implications for practice, reflection and further reading. · Chapter overviews, questions for reflection, and additional case studies of actual existential practice. The second edition of Existential Therapies represents an important update of this important text. 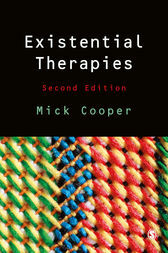 Mick Cooper respectfully examines the differences and similarities of the various major approaches to existential therapy. This should be required reading for all student and scholars in existential psychology.